The music tradition at All Saints' Parish is a rich one. Parish Choir and Quin Choir at the 10:30 service. Organ, but no choirs at the 8:00 service. 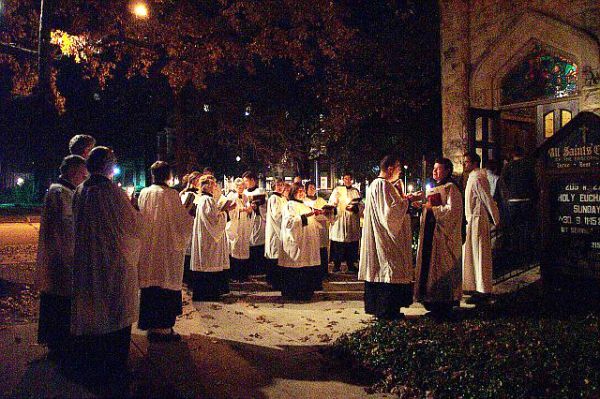 Music plays a large role in many special services during the year, such as Advent Lessons and Carols, Christmas Eve services, the Choral Mass, and Holy Week services. This year the annual Choral Mass was on April 7th. The Choir and string orchestra performed the Little Organ Mass by Franz Joseph Haydn with Gregory Eaton conducting the Choir, and Chamber Orchestra. The Parish Choir has Choral Evensong monthly on most of the last Sundays of each month (4:00 p.m.), and sings as usual for Ash Wednesday and the special services of Holy Week including Maundy Thursday and Good Friday. Members of the parish participate as guest instrumentalists in worship services. Any other members of the parish who play an instrument and might wish to be included in the parish music, from time to time, will feel free to contact Gregory Eaton. He would be very glad to find ways to include any member of the parish who might be interested in taking part in the musical portion of our worship. Along these same lines, several people have expressed interest in reviving the All Saints’ bell choir. Gregory will be having a meeting with anyone interested after church, in order to determine the feasibility of moving forward with enough people to form a workable bell choir. Gregory Eaton came to All Saints’ after over 15 years of playing weekly concerts in his previous parish. He is interested in finding ways in which to do some sort of regular organ programs here at All Saints’. He welcomes any ideas for how future programs might be worked into All Saints’ already generous round of parish activities.